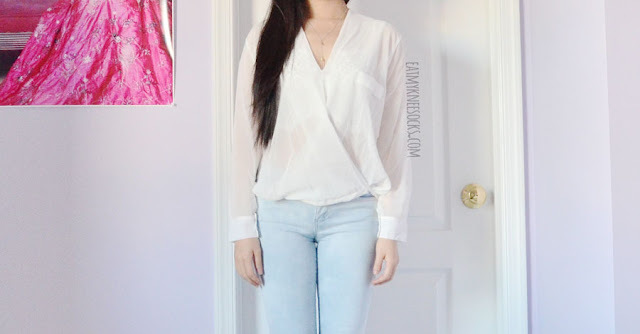 First up: a sheer white chiffon wrap blouse, sold in sizes S-XL. This long sleeve blouse features a v-neck front, faux pocket accent, and surplice-style wrap cut. 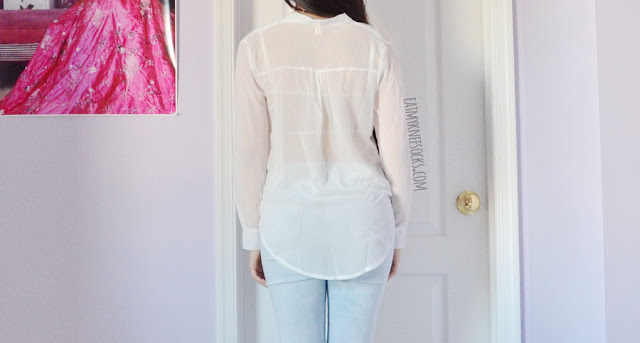 Made of a lightweight, semi-sheer chiffon, this piece elevates the look of a regular blouse with a slight dip hem/high-low style and loose, relaxed fit. I got this piece in size S and it fits nicely, with a draped front and flowy feel. While the sizing is accurate to Romwe's product description, the neckline is a bit higher than pictured in the store photos. I'd originally hoped for this to be a layering piece with more of a plunging neckline, so this difference was a bit disappointing for me. The material is light and breathable, and though there are some loose threads, it's pretty good considering the low price. It's a semi-sheer piece, so I'd recommend wearing a bralette or crop top underneath. One thing that I like about it is how versatile it is; it's definitely a piece that can easily be dressed up or down, whether you wear it casually with the front tucked into jeans, or pair with a blazer and cigarette pants for a more professional look. 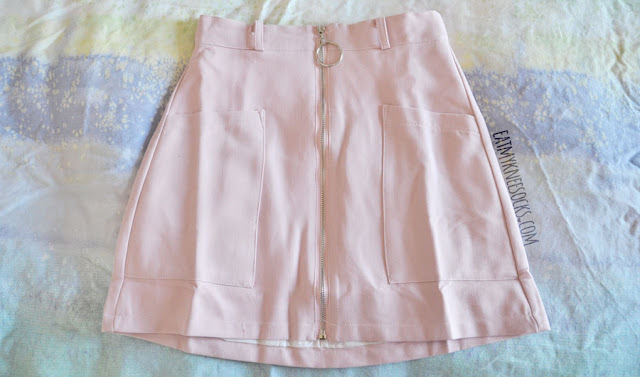 The second piece I got was a pink o-ring skirt, offered on Romwe's site in sizes S-M. Constructed from a light, stretchy fabric with a smooth inner lining, this skirt provides an effortless blend of comfort and casual-cute style. The front features two large pockets and an o-ring accented zipper, and the skirt has belt loops all around, which allow you to wear it as-is or accessorize with a stylish belt. I picked this skirt in size S, which could fit XS-S since, unlike what's stated in Romwe's product description, the material has a decent amount of stretch to it. 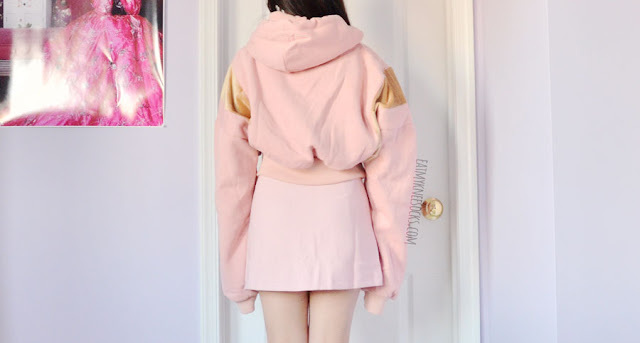 The skirt also features a figure-hugging fit along the waist that transitions into a slightly flared a-line hem, with a soft pastel pink hue and silver zipper. The skirt is a bit too long for my personal preferences, but nonetheless a super cute and well-made piece. Although the color and material of this piece is best suited for spring, it could definitely work for summer too, or even autumn and winter. Pair with a cute crop top for the hot summer months, tuck in a blouse for spring, layer over tights for fall, or wear under an oversized sweater during the winter! Here, I wore this piece with a For Love and Lemons lace bralette and a pink satin bomber jacket (reviewed here) for a refreshing, spring-ready look. 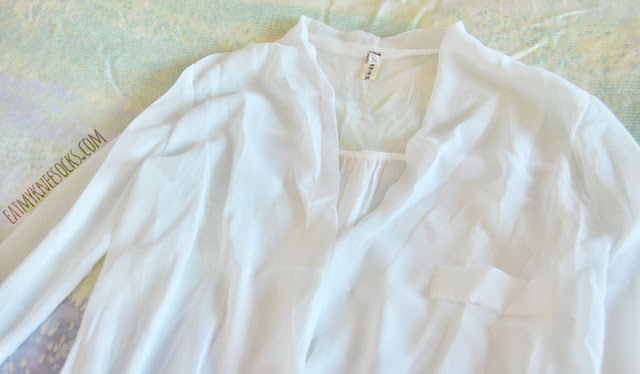 Next is an open back satin blouse, originally sold in sizes S-L. Satin is one of the hottest fabrics this season, and one of my personal favorites as well, so needless to say I had to try this piece! 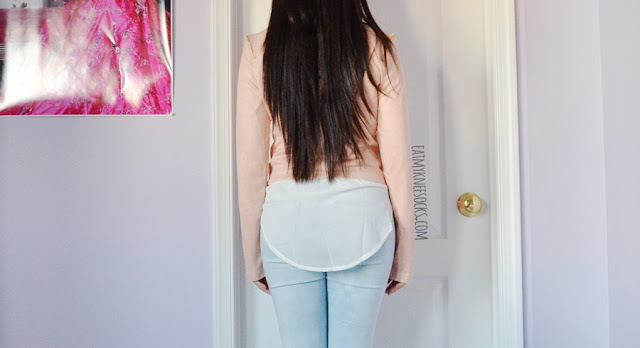 This unique mock neck blouse features long sleeves, a keyhole cutout at the front, and a daring open back design. 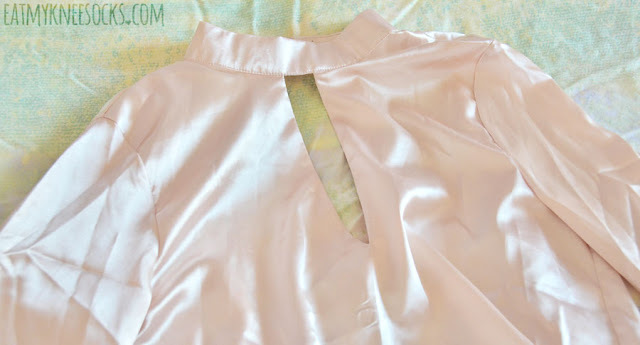 Made of a silky-smooth satin in a pale pink beige hue, this top gives off major romantic vibes. I'm absolutely obsessed with the fabric of this, which has a luxurious sheen to it. The fit, however, wasn't as great as I'd hoped. The sleeves were a bit too bulky and short for my preferences, while the shoulders run a bit on the tighter side. The highlight of this piece is actually the back, which features a dramatic cutout and flowy satin paneling that drapes along the sides. 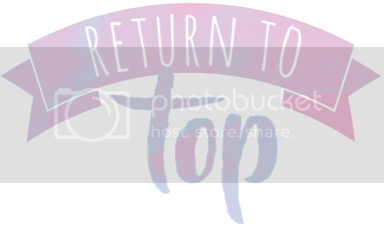 It's a really interesting concept and is perfect for showing off a cute crop top or bralette, but I wish the panels were sewn in place so it'd be easier to style. This fourth piece, an oversized printed cropped hoodie, is hands-down the most unusual piece of the five, sold in a one-size-fits-all. 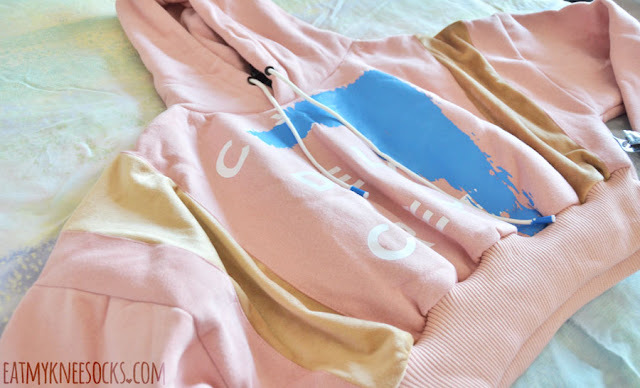 This pastel pink hooded sweatshirt features a minimalist blue-and-white typographic print, golden velvet paneling at the shoulders, and super long and wide sleeves. 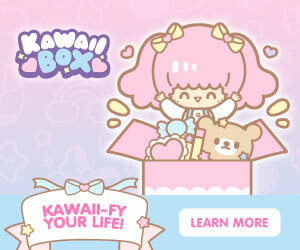 The fabric is thick and high quality, and the inside is lined with a fuzzy fleece for extra warmth and comfort. To say this piece is oversized is an understatement; I typically wear size XS or S, and I feel like I'm drowning in this. 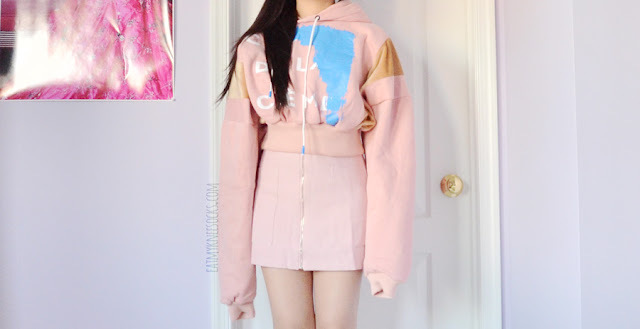 The sleeves extend way past my arms, and the hood is nearly big enough to cover my entire face. Unfortunately, I don't think I can pull off this sweatshirt, but it really is a very unique, unusual statement piece. 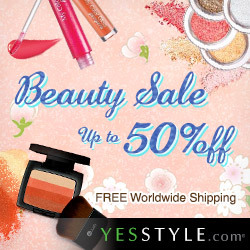 But if you're a fan of the oversized look and like more experimental, bold pieces, this could work for you! 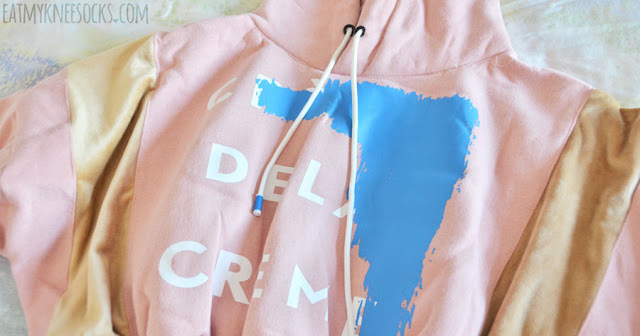 It's definitely a really well made, high-quality sweatshirt, and, despite knowing how awkward it looks on me, I love wearing it because of how warm and soft it is. 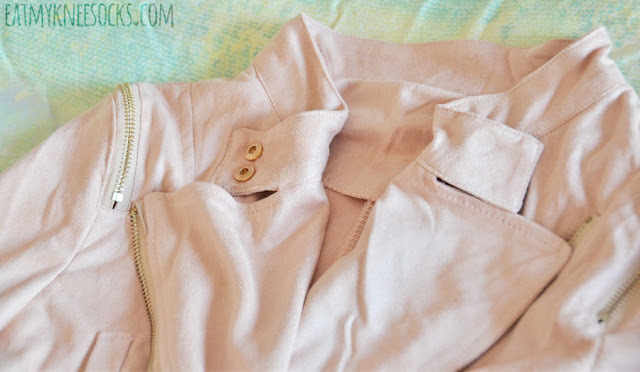 Last up is my personal favorite from this Romwe fashion haul: a faux suede moto jacket. 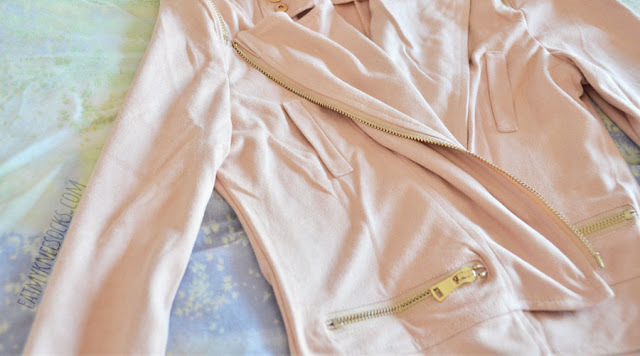 This one-size-fits-all jacket blends the edgy, rocker vibes of a moto jacket with the softness of a pale pink faux suede fabric, and the result is truly stunning. With tons of golden accents, slightly structured shoulders, and an oblique front zipper that allows it to be worn in multiple ways, this jacket is a must-have. 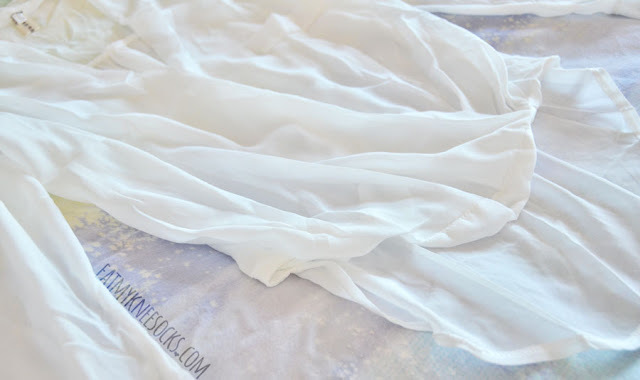 The fabric is super soft and comfortable, with slight stretch and a relaxed fit. The jacket fits a bit big on an XS but still looks great, and I think it'd look even better on someone who regularly wears an S or M.
I've been wanting to buy a moto jacket for a while and was ecstatic to find this one, which swaps the classic leather for a sweeter, softer, and more romantic faux suede. 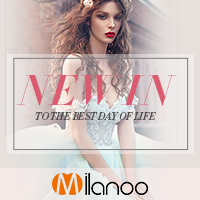 The color is perfect for spring or autumn, and this jacket looks beautiful whether you wear it open-front or zipped up, with a style that can accompany you from day to night! 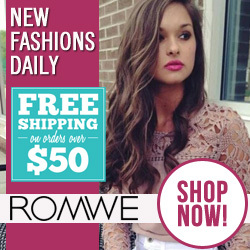 Of these five piece from Romwe, some were hits and others were misses. 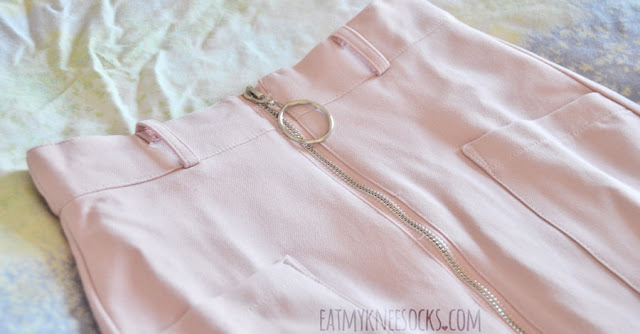 My personal favorites were the pink faux suede jacket and o-ring mini skirt, both of which are great buys for the price. On the other hand, items like the white chiffon blouse and mock-neck satin top could have been better in quality and sizing. 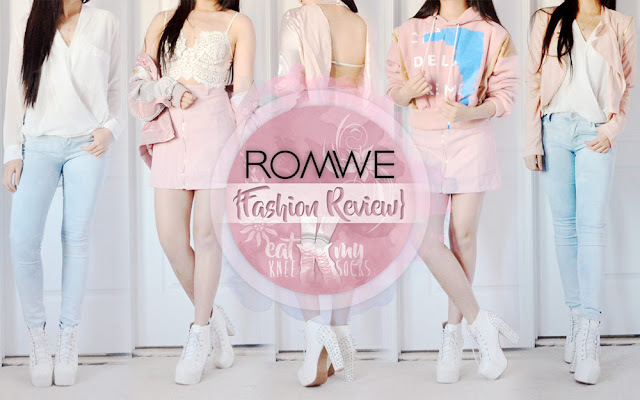 Find more of my Romwe fashion reviews here! Muscle building and fat loss now in-one formula. Yes, it is the Legal Anavar we are speaking of. 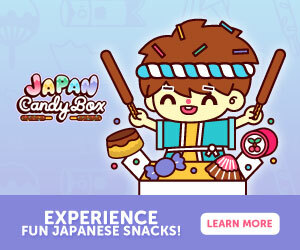 Willing to know where to buy Anavar in Australia? 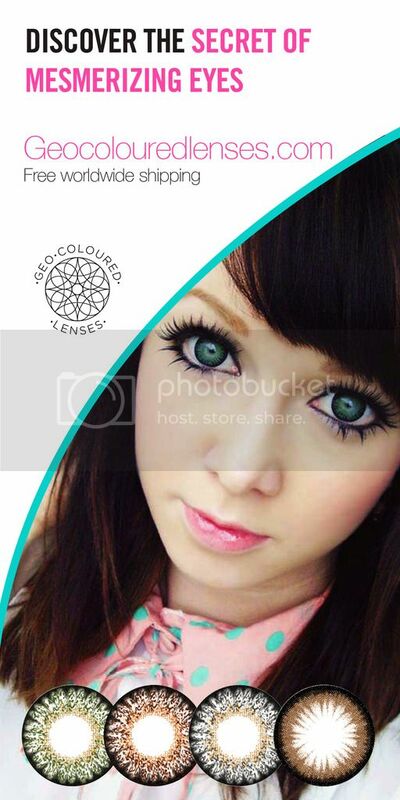 Take a look at www.Aussieofficial.com.